Nickel atoms have 28 electrons and the shell structure is 2.8.16.2. The ground state electronic configuration of neutral nickel is [Ar].3d8.4s2 and the term symbol of nickel is 3F4. Nickel: description Your user agent does not support the HTML5 Audio element. Nickel is found as a constituent in most meteorites and often serves as one of the criteria for distinguishing a meteorite from other minerals. Iron meteorites, or siderites, may contain iron alloyed with from 5 to nearly 20% nickel. The USA 5-cent coin (whose nickname is "nickel") contains just 25% nickel. Nickel is a silvery white metal that takes on a high polish. It is hard, malleable, ductile, somewhat ferromagnetic, and a fair conductor of heat and electricity. Nickel carbonyl, [Ni(CO)4], is an extremely toxic gas and exposure should not exceed 0.007 mg M-3. 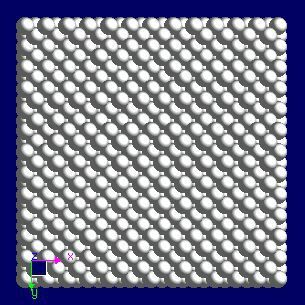 The solid state structure of nickel is: bcc (body-centred cubic). Nickel is an essential trace element for many species. Chicks and rats raised on nickel-deficient diets have liver problems. Enzymes known as hydrogenases in bacteria contain nickel. Nickel is also important in plant ureases. Reactions of nickel as the element with air, water, halogens, acids, and bases where known. Binary compounds with halogens (known as halides), oxygen (known as oxides), hydrogen (known as hydrides), and other compounds of nickel where known. Bond strengths; lattice energies of nickel halides, hydrides, oxides (where known); and reduction potentials where known. Nickel was discovered by Axel Fredrik Cronstedt in 1751 at Sweden. Origin of name: from the German word "kupfernickel" meaning Devil's copper or St Nicholas's (OLd Nick's) copper. 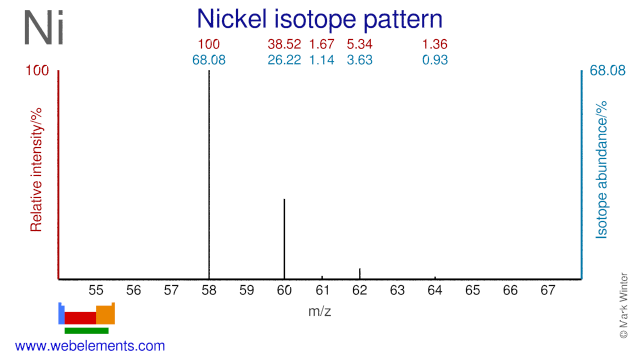 Isotope abundances of nickel with the most intense signal set to 100%. Nickel isotopes are used for the production of several radioisotopes. Ni-64 is used for the production of Cu-64 which is used in radioimmunotherapy. Ni-61 can be used for the production of the PET radioisotope Cu-61. 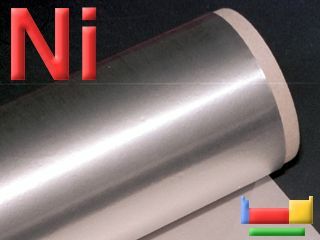 Ni-62 is used for the production of the radioisotope Ni-63 which can be used as an XRF source, as an electron capture source in gas chromatographs and as a power source in microelectromechanical systems. Ni-58 can be used for the production of the radioisotope Co-58. Ni-60 is used for the production of Co-57 which is used in bone densitometry and as a gamma camera reference source. Ni-60 is also used as an alternative for the production of Cu-61, but the route via Ni-61 is more common. 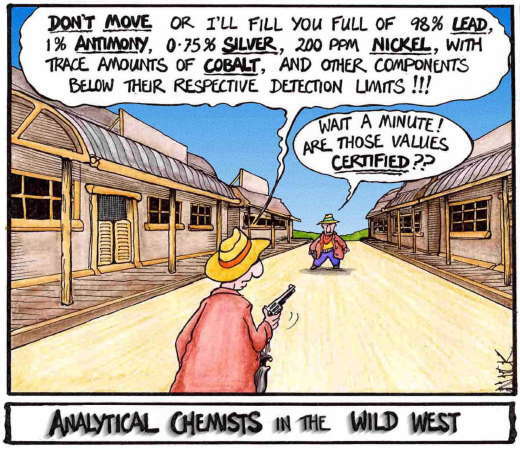 Finally, most stable Nickel isotopes have been used to study human absorption of Nickel. Isolation: it is not normally necessary to make nickel in the laboratory as it is available readily commercially. Small amounts of pure nickel can be islated in the laborotory through the purification of crude nickel with carbon monoxide. The intermediate in this process is the highly toxic nickel tetracarbonyl, Ni(CO)4. The carbonyl decomposes on heating to about 250°C to form pure nickel powder. The Ni(CO)4 is a volatile complex which is easily flushed from the reaction vessel as a gas leaving the impurities behind. Industrially, the Mond process uses the same chemistry. Nickel oxides are reacted with "water gas", a mixture of CO + H2). Reduction of the oxide with the hydrogen results in impure nickel. This reacts with the CO component of the water gas to make Ni(CO)4 as above. Thermal decomposition leaves pure nickel metal.